Color: Purple, Pink, Yellow, Green, White. Size: Size: Opening diameter: 4", Height: 5". This kind of simple and convenient planter will add simplicity and modern style to caring for your plants. Especially fits for the people who haven't much time to grow plants, but also very fond of plants. Also, it can help you to care your plants when you go outside a couple days or on business. 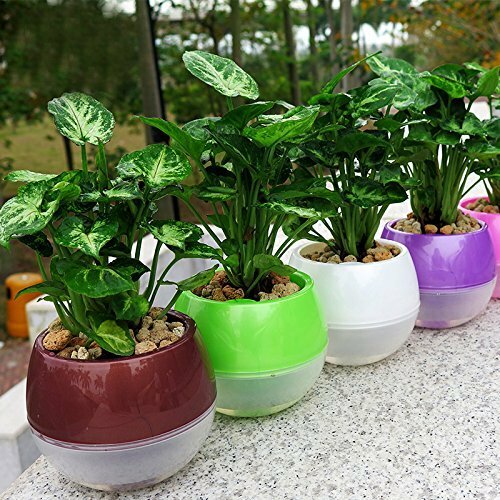 The planter is made of high quality plastic, Self-Watering Planter. Strong and durable, breathable. Most importantly, thanks to the double-layer design that allows excess water to be stored in the bottom of this planter pot and provided to your plant as needed. And it greats for indoor or outdoor use. Let your home life more environmentally friendly and interesting. Ideal for home, office, family gardening decoration and planting. Bring a green living to your home. Environmental protection and healthy. And we will send the color randomly! Size: Opening diameter: 4", Height: 5". Simple and creative design. Automatic watering, Self watering planter ensures the plants take enough water they need for days, and you don't have to water frequently. Material: Made of high quality plastic, Strong and durable, water-saving drought-resistant, breathable, not easy deformation, corrosion resistance. great for indoor or outdoor use. No plant includes in this item! Thanks to the double-layer design that allows excess water to be stored in the bottom of this planter pot and provided to your plant as needed. It also can help you to care your plants when you go outside a couple days or on business. Suitable for home, office, family gardening decoration and planting. Bring a green living to your home. Environmental protection and healthy. Please note that we will send the color randomly. Mkono is a registered trademark and our product is professional manufacturing and sole selling.